Good afternoon and happy Tuesday. 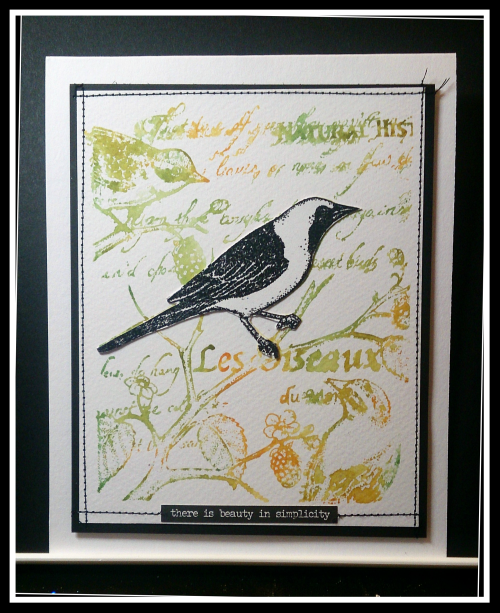 I'm over on the Lost Coast Designs Portal To Creativity with my second C&S card. This is my new favourite Carmen's Veranda stamp Birds Collage Background, that's been inked with Distress inks. There's still time for you to join in with the challenge, but be quick, but hey it's only C&S, what could be easier.... - well, just about anything!! Missed you Sue.. Welcome back. The wording says it all with this card and it needs nothing more or less. Great for both genders..
A work of art and a beautiful one! Just gorgeous, Sue! That's some stunning vari-coloured stamping, Sue - with a gorgeous stamp.